The Franciscan Family Apostolate has supported a range of programs in both Alleppey and Andhra Pradesh to assist the poor on the path to self-sufficiency. If you would like to support the Franciscan Family Apostolate in these efforts, we would welcome donations to the programs listed on our Support a Program page. You can learn about each program by clicking on the photo with each listing. 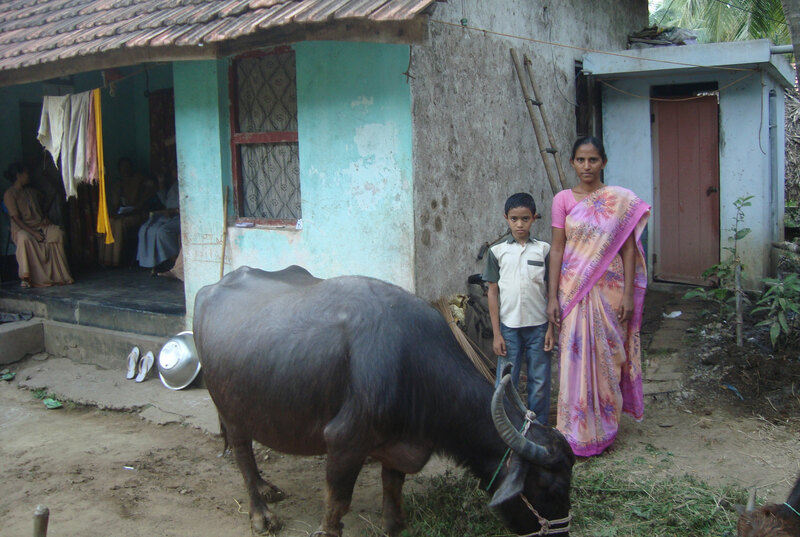 The photo above is of a family that received a buffalo through the Andhra Pradesh Self Development Fund. Once you have selected a program, decide how much you would like to contribute. We ask only that you give what you can afford. You may use PayPal to send your donation by filling in the amount you wish to contribute in the space provided on the program’s page and then clicking on the ‘Add to Cart’ button. You will then see a page which confirms your choice and allows you to pay through PayPal (you do not need a PayPal account to use this method, you will be allowed to use any credit card for payment). After you have completed payment in PayPal, you will be returned to our site to complete your order. If you do not wish to use PayPal, you may to call or email the Franciscan Family Apostolate main office in CT with your selection. If you are using Paypal to remit your donation, we would appreciate if you would please add 4% to your donation (approximately $1 for a $25 donation) to cover the cost of PalPal processing.